Happy Holidays from City Critters! Homeless cats are in endless supply, but the money needed to care for them and place them in loving homes is not. Please consider making a donation via our PayPal or Network for Good links, or by using our Amazon Smile link for your last-minute shopping. We'd like to remind everyone that our PetSmart adoption center is now located in the Flatiron PetSmart store at 1107 Broadway (between 24th and 25th Streets). Come visit us there! And as always, you can meet our cats at Petco, 991 Second Ave (between 52nd and 53rd Streets). 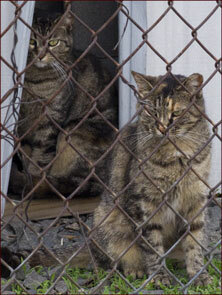 between 24th and 25th St.
City Critters is a New York State 501(c)(3) nonprofit formed in 1994. Our mission is to improve the lives of companion animals in our city by rescuing and placing stray and abandoned cats, promoting spay/neuter programs, and working with members of our community to find humane solutions to problems involving homeless animals. Donations to City Critters are tax deductible to the fullest extent of the law. Our financial statements and IRS designation letter are available upon request. Thanks to a generous grant from Maddie's Fund received at the end of 2015, we are working on increasing our outreach through social media and strengthening our foster network in order to help as many cats as possible — including cats that need extra TLC to get them ready for adoption, or sspecial promotion to attract adopters. CBSNewYork.com has teamed up with the Mayor’s Alliance to feature a dozen of the top shelters and rescue groups in the city. City Critters is very pleased to be one of the rescue groups included.